Five years worth of award winning reviews based on performance, comfort and value. High-Tech Teflon coated fabrics which are fast, breathable and offer great coverage. Top quality triathlon pad, leg grippers and attention to detail. In built shelf bra with zip for easy access. The new ‘Aquaflo Plus’ range takes our award winning Aquaflo collection to another level. The Tri suits, Shorts and Tops feature our highly rated water repellent Aquaflo fabric and this is combined with an ultra soft and flexible mesh fabric for improved ventilation and styling. There is an abundance of new features to improve comfort and functionality further and we hope this range will create a benchmark in the industry for the performance and quality which can be achieved within an entry/mid-range price point. The range is an update on the long standing Aquaflo range which achieved the ‘BEST BUY’ award in 220 Triathlon magazine in 2011, 2012 and 2014. The collection is designed to improve speed, endurance and comfort and is full of top of the range features but without the top of the range price-point. This suit has been designed exclusively for women based on feedback from some of the U.K.’s most experienced triathletes. 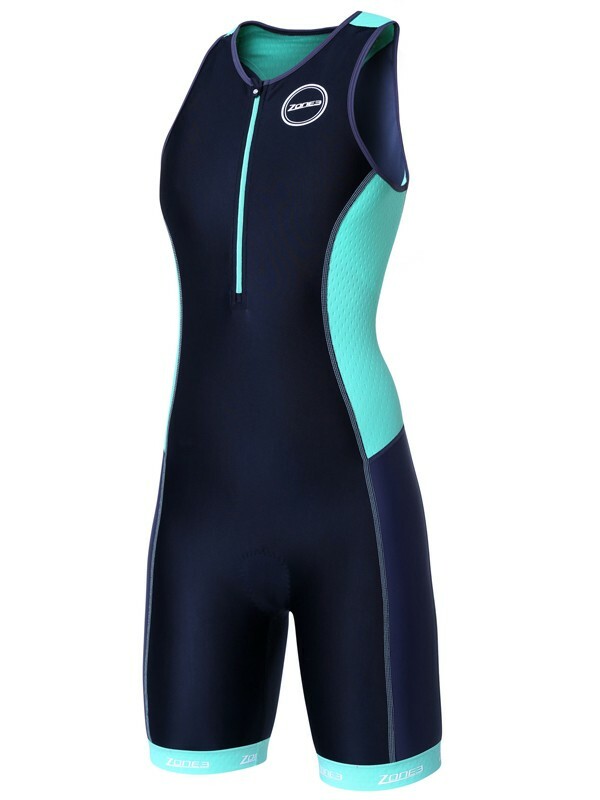 The feedback underlined that female triathletes are not only looking for a high-performing suit but one that also ensures comfort and support. The suit has been designed with these features in mind, whilst also keeping a contemporary and stylish look. This suit has now had over five years worth of great customer reviews as well as winning 220 Triathlon Magazine’s ‘BEST BUY’ award in 2011, 2012 and 2014, in addition to Triathlon Plus Magazines’s ‘Top Value’ award. 1. Aquaflo™ is a fast and comfortable fabric. It is designed to give you low levels of drag thanks to its water repellent Teflon coating. You will notice that when the fabric has water splashed on to it, it will bead up and flow straight off the suit, this effect is maximised during the swim. This hydrodynamic effect is maximised during the swim helping to achieve faster times. It also means less water is absorbed making the suit lighter and quicker to dry once on the bike. It is made from Xtra-Life Lycra® which ensures great shape retention and comfort throughout the race. The main body of this range is made from a black or navy colour to ensure modesty and superior coverage. 2. Balanced Compression is provided through the legs thanks to a carefully designed pashape and the high denier rating of the Aquaflo fabric. This improves muscle support and helps to increase the blood flow away from the legs, therefore reducing the amount of lactic acid build up and helping to improve your endurance and stamina. 3. Revolution-X is a latest generation tech-fabric made in Italy and is used on the back panels as it is very lightweight, offers 360o stretch and is extremely breathable. 5. Inner Bra – designed to give extra support, especially during the run phase. The bra also has a zip on the front making it much easier to get the suit on and also allows you to use the main suit zipper on the front without exposing too much chest. 6. Tri-lite pad: A female specific made to measure triathlon pad. Small and neatly positioned, the pad also features different thickness levels to ensure comfort and minimise any saddle pain. It is designed to minimise any water absorption and provide protection during the cycling phase, without impeding your swim or run. Also, new fine-line stitching to further reduce any irritation. 7. Silicone UFO leg grippers – Newly designed leg grippers combine a soft elastic material with internal and external silicone. These grippers are stitched to the bottom of the leg material rather than inside to create a more comfortable fit and do a fantastic job of preventing any movement during the cycle and run. 8. Storage pockets with an elasticated band ensuring easy access to any nutrition, spares or valuables. 12. Total Zip protection: Soft fabrics are used to cover the inside of the zipper and this is combined with ‘fold over’ cover to minimise any discomfort from the zip on the chest. 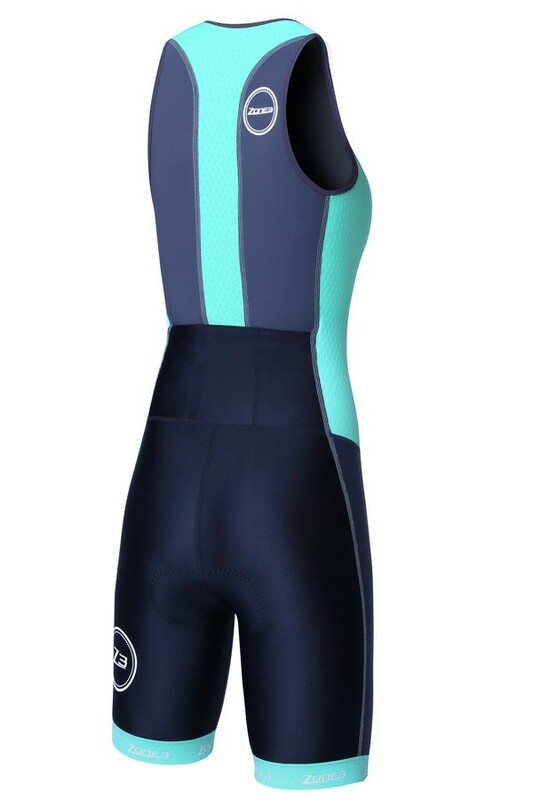 This is a fantastic looking suit with superior aero dynamical performance, breathability and balanced compression. It’s been tried and tested for years and is available at a great price point.